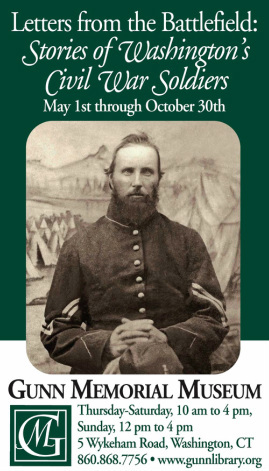 Welcome to Letters from the Battlefield: Stories of Washington's Civil War Soldiers, an online exhibit presented by the Gunn Memorial Museum. To commemorate the 150th anniversary of the Civil War, the Gunn Memorial Museum presented the exhibit, Letters from the Battlefield: Stories of Washington's Civil War Soldiers. Visitors experienced an extremely personal and powerful view of the Civil War as told as told through the actual words of Washington's soldiers. The exhibit was on display from May 1, 2011 to October 30, 2011; however, in order to continue sharing the experiences of Washington's soldiers, this website was created. This website is a work in progress, so please check back from time to time. We will continue to add content to this website from the exhibit as time allows, and new research as we discover it. Please contact us if you have information to share. "My time is not my own it belongs to Uncle Sam. When he says must work, work I must and that is most all the time. You know the old saying 'All work and no play makes Jack a dull boy.' Well I am afraid I shall get to be a dull boy If I stay with Uncle S much longer."